This account is intended to provide a complete synthesis of over a decade of research and inventory on the Northern Pacific Rattlesnake (Crotalus oreganus oreganus) throughout the species’ Canadian range. This synthesis also includes an analysis of covariates on a collaborative snake den database that was initiated by Mike Sarell and subsequently (and collaboratively) expanded, refined and maintained by both M. Sarell and J.Hobbs. In addition relevant learning’s from my MSc thesis work are included as this research on the species’ thermal ecology adds clarity and provides important information regarding our understanding of appropriate survey timing windows for this species in BC. The section on den ecology presents a summary of den site characteristics favored by the species in BC. The “Summary of Existing Information” section provides the first (and only) province wide assessment of various influential covariates including den elevation, distance to road, tenure and provincial distribution (within each of five provincial populations). The “Discussion” and “Conservation Recommendations” sections provide a context-based perspective with insights on how these covariates are suspected to affect vital rates for rattlesnakes in BC. In addition, the BC snake den database was also used to develop new, more accurate and current range maps for gopher snakes, rattlesnakes and racers in BC. A revised and more accurate range map for the species, in BC, is presented here. 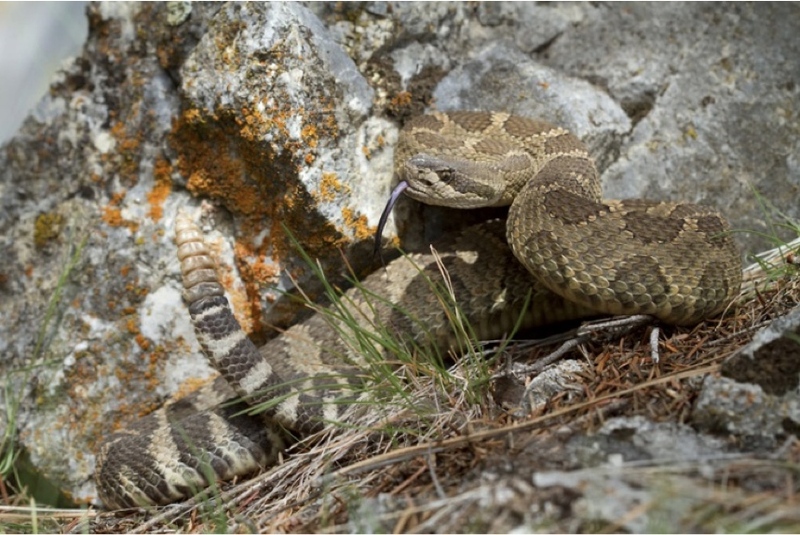 The results presented here suggest there is strong cause for conservation concern regarding the continued persistence of the Western Rattlesnake in BC. 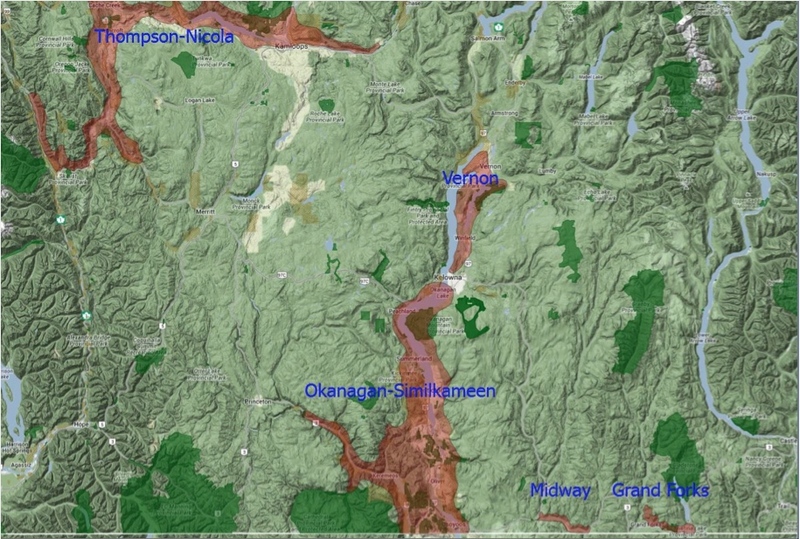 The species has been extirpated from several large areas of its former range in both the central portion of the Okanagan population and from large areas along the south side of the Thompson Valley from Chase to Ashcroft. More localized extirpations are also evident in the Midway and Grand Forks populations. Indeed, there are only five meta-populations (see Discussion) in BC that remain relatively un-impacted by negative anthropogenic influences. Stronger and more effective legal protection for this species is likely required to arrest or reverse apparent range wide declines of rattlesnakes in BC. Cascades into Washington, Idaho, Oregon and east of the Cascades in California. This new polytypic species is now referred to by its common name, the Western Rattlesnake (C. oreganus), with five recognized subspecies (Rubio. 2010). In North America, the Western Rattlesnake (Crotalus oreganus) is the most northerly distributed species of the Crotalinae sub-family. The nominate subspecies, C. o. oreganus, retains its previous common name (the Northern Pacific Rattlesnake) and extends further north than any of the other four sub-species of Western Rattlesnake as it extends north into BC. Within Canada, the Northern Pacific Rattlesnake is the only extant subspecies of the Western Rattlesnake clade1. Because Canada is home to onlya single sub-species of the Western Rattlesnake (i.e. the Northern Pacific Rattlesnake), this sub-species can be referred to by either the full species name (Western Rattlesnake) or the sub-species name (Northern Pacific Rattlesnake) when discussed in a Canadian context. The remainder of this report is focused on the Northern Pacific Rattlesnake as a sub-species of the polytypic Western Rattlesnake. 1: Two other species of rattlesnake occur in Canada – the Prairie Rattlesnake (C. viridis viridis) occurs in Alberta and the Eastern Massasauga Rattlesnake (Sistrurus catenatus catenatus) occurs in Ontario. In BC, the Northern Pacific Rattlesnake (Crotalus oreganus oreganus) occupies portions of the dry southern interior grasslands of BC and is designated as a ‘blue listed’ species by the BC Conservation Data Centre (BC Conservation Data Centre 2012) and as ‘threatened’ by the Committee on the Status of Endangered Wildlife In Canada (COSEWIC 2012). Restricted geographic range within BC, threats (habitat loss and persecution), and reported declines in the BC population (due to localized extirpations and habitat loss) make this species a cause for conservation concern (Charland et al. 1993). As such, the Northern Pacific Rattlesnake is also listed on the federal Species at Risk Act (SARA) under Schedule One; its residences (including den (hibernacula) features and mating sites) are legally required to receive both federal and provincial protection under SARA (on federal land) and under the Bilateral Agreement (on provincial crown land and on private land). In North America, the Northern Pacific Rattlesnake occurs on the east and west sides of the Cascades from Oregon north to western Washington along the US portion of the Okanogan River Valley with extensions into Canada. In Canada, the northernmost population of the Western Rattlesnake occurs along the Thompson-Nicola (and Fraser) river drainages and is geographically disjunct from the three BC populations that occur along the international border. This northernmost population has likely been disjunct since the hypsithermal periods (~9,000-5,000 ans)1. This is suspected to be the northernmost extent of the range of the Crotalus genus in North America2. The three southern BC populations include the Grand Forks, Midway and Okanagan-Similkameen Populations. All three southern populations of C.o.oreganus are geographically contiguous south of the international border. population likely occurs east to Chase along the South Thompson River (Hobbs. further east along the Nicola Valley to Spirit Creek (B. Davis, pers. no evidence of an established population or den at this site. Osoyoos and continue north along the Okanagan valley to Vernon. International Border) northwest to Bromley Rock. population to the East Kettle population. The total number of dens for each population is summarized in Table 1. It should be noted that there is a potential fifth population, along the west shore of the Columbia River, near Trail, BC. A single historic record exists for the area however current confirmation of continued occurrence of an extant population in this area is required. The species is currently confirmed near the town of Northport, Washington approximately 13km south of the international border near Trail. Climate Optimum (HCO) was a warm period during roughly the interval9,000 to 5,000 years before present. This event has also been known by many other names, including: Hypsithermal, Altithermal, Climatic Optimum, Holocene Optimum, Holocene Thermal Maximum, and Holocene Megathermal. 2: The population of C.viridis in Brooks, Alberta potentially extends further north but current records suggest that the most northerly den in Dinosaur NP is 8.6km further south than BC’s most northern den (Abandonment Den) near Cache Creek. Figure 1: Distribution of the Northern Pacific Rattlesnake in BC showing all four populations. Red shaded areas represent the current confirmed range of the species in BC. The grey line indicates the international border. The potential population, near Trail, is not shown on the map. have been confirmed at 380 of the 459 known dens reported below. spicatum) and big sagebrush (Artemisia tridentata); and open parkland forests characterized by Douglas-fir (Pseudotsuga menziesii) and ponderosa pine (Pinus ponderosa). These vegetation types are recognized as the Bunchgrass (BG), Ponderosa Pine (PP) and Interior Douglas-fir (IDF) Biogeoclimatic Zones (BEC) and occur primarily within the Thompson-Okanagan Plateau Eco-region. In BC, the Northern Pacific Rattlesnake has been confirmed at elevations ranging from 152 m to ~1,430 m ASL (L. Gomez. pers.com. ), however reports exist for at least two populations (Cathedral Mountain) above 1,750 m (M. Sarell, pers. com.). Elevation of known rattlesnake dens in BC (n=318) is from 292-975m ASL (BC Snake Den Database-2012). River canyons is the northern extent of the species’ range in North America. This population is unique in BC because, unlike the other BC populations, it is disjunct from the larger US population to the south. Habitat connectivity was likely lost after the Hypsithermal Period (see P.7) approximately ~6,000-9,000 years ago (Cannings and Cannings 1996). As such, continued persistence of this population is completely dependent on survival of snakes within this sub-population. Over the past decade there has been significant effort devoted to inventory of den sites, within the Thompson-Nicola sub-population of rattlesnakes (data available from MFLNRO). This allocation of effort was intended to address a relative ‘gap’ in our provincial understanding of the species’ ecology. We currently have 76 documented/confirmed rattlesnake dens in this population as a direct result of these efforts. Figure 2: Map depicting the current range extent of the Thompson-Nicola population. population with the Okanagan-Similkameen populations. Further south, connectivity is maintained across the international border into Washington along corridors of suitable habitat that follow the undeveloped valley slopes that span the International Border. The South Okanagan-Similkameen population encompasses portions of the Okanagan and Similkameen Valleys. Known dens range in elevation from 356-975m ASL and occur within the BGxh1, PPxh1 and the IDFxh1 BEC variants (Meidinger and Pojar 1991). Dominant vegetation at the den sites is typical of desert and grassland shrub-steppe habitat and includes antelope-brush (Purshia tridentata); big sagebrush, rabbit brush (Chrysothamnus nauseosus) and Bluebunch wheatgrass plant communities. Den substrates mainly occur within granite and gneiss rock outcrops. Figure 3: Map depicting the four southern populations in BC, note the fifth suspected/potential population near Trail, BC is not shown. Aggregation to survive the hibernation period is perhaps one of the most interesting behavioural attributes of snakes. Information on thermal characteristics of den sites and of over-wintering Northern Pacific Rattlesnakes will improve our understanding of the species’ ability to overcome the thermal challenges that it faces at the extreme northern limits of its range. As well, this information will help managers identify important habitats and develop guidelines for the conservation of rattlesnakes in British Columbia. The importance of over-wintering dens (i.e. hibernacula) to the ecology of snakes in temperate regions, coupled with the high fidelity of snakes to these sites (Klauber 1972) suggests that the conservation of these sites is likely required to ensure snakes continue to persist on the local landscape. Four main components are suspected to influence the suitability of a site for bedrock denning. It is useful to be aware of these attributes when attempting to objectively assess the denning potential at a site. Dens can also occur in fluvial material (Bertram et al. 2001) although these “earth dens” are suspected to be rare as significant retreats that penetrate below the frost line are more typically associated with rock material, especially in the Cariboo where there are few burrowing rodents. a greater proportion of solar radiation (relative to ‘cool’ aspects). sun, will receive the most solar radiation. positioned in a shaded ravine. albedo surfaces tend to emit more heat. 2. FRACTURING: This component also has significant influence of the suitability of a site’s potential for denning and is weighted equally to thermal momentum in its importance. Fracturing refers to the level of fracturing that is evident in the rock or denning material. Certain types of rock are more prone to severe fracturing than others (e.g. basalt and gneiss). Fractures must be deep enough to penetrate the denning material well below the frost line and access geothermal heat. Internal den temperatures and den probe measurements collected from 15 dens suggest that depths between 0.86-3.00 m may be sufficient to facilitate hibernation by rattlesnakes in BC (Hobbs 2007). Typically, these deep fractures occur in rock bodies between geomorphic layering events (e.g. separate volcanic deposits) or at severe stress points (faults) in the rock face. Deep talus may also provide deep fractures suitable for denning. 3. HUMIDITY: Although there is little supporting evidence for this second factor, the humidity in the den may also influence winter survivorship. In BC, there have been no previous attempts to quantitatively measure the effect of relative humidity on survivorship. However, Macartney (1995) suggested that most of the weight loss that occurred in snakes (measured prior to entering the den and upon emergence from the den in the spring) occurred due to water loss (desiccation) and was not due to fat loss (starvation). In the Okanagan, many dens have been found at the base of cliffs. This position is often associated with a higher level of moisture as surface precipitation drains down the impermeable cliff face to reach the toe of the cliff. The relatively higher moisture levels at these sites are often indicated by the presence of plant species typically associated with more mesic sites than the surrounding xeric habitats. Species such as rose (Rosa spp. ), sumac (Rhus glabra), poison ivy (Toxicodendron rydbergii) and chokecherry (Prunus virginiana) find a niche in these areas because of the higher moisture content present in the “drip zone” of these cliffs. The increased moisture levels associated with these sites may increase the humidity levels within dens located at these sites and may be of benefit to over-wintering snake populations. 4. COVER: Upon spring emergence from the den and fall retreat into the den, snakes tend to spend a disproportionate amount of time at or near the den entrance engaged in thermoregulatory activities (i.e. basking). During denning, snakes enter a type of torpor and their body temperature falls significantly (Rubio 1998). During torpor, digestive processes are halted and any food matter remaining in the digestive system may putrefy and cause poisoning (Macartney. 1996). Effective thermoregulation may be particularly important prior to entering the den in the fall to aid completion of any digestive processes that are occurring. Upon emergence in the spring, thermoregulation may also be important in restoring metabolic processes when reviving from torpor. In many species of Thamnophis, mating also occurs at the den entrance upon spring emergence. Due to the disproportionate amount of time spent at or near the den entrance engaged in this type of thermoregulatory behaviour, available cover (at or near the den entrance) may have a direct influence on predation levels. Most dens (personal obs) appear to feature components of cover that may influence survivorship. These areas are referred to as solariums and may be provided by vegetative matter or rock material. Coarse talus, bushes, boulders (with cavities underneath) and other similar objects near the den are all heavily used by snakes as cover objects during the spring and fall emergence and retreat and may be of significant importance. Cover must also be available along movement corridors near the den. Cover along these movement corridors may be provided by vegetation, which, as discussed previously, often increases in diversity and density along the drip line of significant cliffs. Snake movement corridors are often found in these areas and are evidenced by snakes and snake tracks in the vegetation along the base of cliffs near den sites. Talus is also often used to provide a covered approach along movement corridors between the den and the summer range and may be an important component in poorly vegetated rocky areas. Bands of coarse talus extending below a cliff towards foraging habitat can provide effective security cover (and foraging opportunities) along subterranean movement corridors. difficult to visually estimate. For example, a den may receive a very low rating of thermal momentum (due to poor positioning and/or aspect) but may still provide ideal denning habitat if fracturing is deep enough to extend well below the frost line (Sarell 1993, Hobbs 2001a). nights when temperatures drop below 9°C. This typically occurs during September through to mid-October although some snakes have been observed traveling back to dens as late as early November in the South Okanagan (M.Sarell. pers com). average, rattlesnakes returned to the den commencing September 17 and that all monitored snakes had returned by October 13th. Median return date was September 22nd (Hobbs 2007). A larger sample size would likely show that ingress, or return movements to the den, generally occur in mid to late September with snakes being reliably seen at dens when evening temperatures in the area fall below 9C° (pers obs). This finding is consistent with prior and subsequent repeated observation and research by the author and others. several days prior to leaving the vicinity of the den to forage for the summer (Hobbs. 2006). In one study in southern BC, over the three-year duration, dispersal from the den occurred between April 23 and May 30 (Shewchuk. 1996). Similarly, in 2006, I attempted to more accurately and precisely define the timing of the spring den egress (i.e. when snakes leave the den). 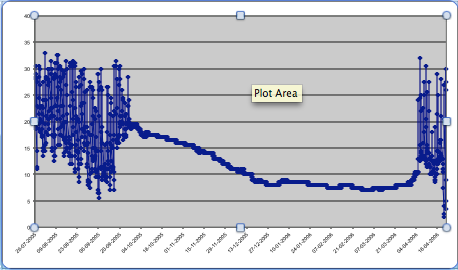 My research refined earlier estimates for spring egress. Emergence from dens began in late March or early April (dates of first emergence ranged from March 22 to April 4). Upon emergence, snakes remained at, or near, the den entrance exiting to bask on the surface during warm or sunny days when surface temperature exceeded 10°C and air temperatures exceeded 15°C. This period of den emergence typically lasts until mid to late April. All monitored snakes (n=8) left the den between April 20-24th. Some snakes may remain at the den beyond this period but the number of snakes visible (or remaining) dwindles rapidly by late April and, as a consequence, den detectability diminishes rapidly. period (although at least some snakes showed a tendency to exit the den periodically, throughout the winter denning period, to bask on the surface (see Figure 4)). A graphic example of internal body temperature readings, collected during my research in 2006/7, illustrates these patterns (Figure 4 & 5). (Tb exceeded internal den temperature). by February-March before exiting the den again in the spring. 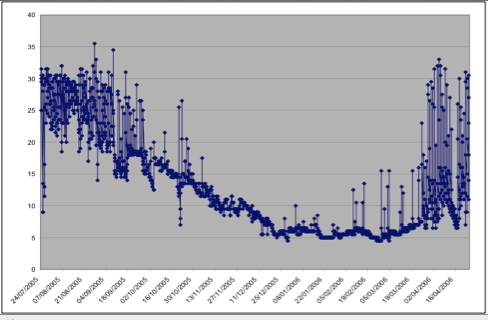 During the denning period, mean Tb was 9.6°C (n=8). Snake (Pituophis catanifer), Racer (Coluber constrictor), Common Garter Snake (Thamnophis sirtalis) and the Western Terrestrial Garter Snake (T. elegans) (Klauber 1972, Macartney 1985, Sarell 1993, Hobbs 2001). Snake populations at some of these dens have been estimated at over 500 individuals (Hobbs 2001). summary level data, as presented here, are available (from the author) for conservation and planning purposes. The database contains coordinate and information (including species observed, approximate den population size (based on head-counts), land tenure, jurisdiction (MOE region) and basic habitat information (including distance to nearest paved road, BEC, elevation, slope, aspect & eco-section). Multiple snakes observed at or near the den entrance. confirm denning with absolute certainty. of the potential den structure). Conservation and protection of all confirmed (C1 status) dens is required as these sites are used, by multiple snakes over multiple generations, for critical habitat, or shelter, during the winter period. All suspected (C2) and probable (C3) sites should be re-surveyed in an attempt to elevate the status of these ‘suspected/probable’ dens to confirmed (C1) status. Candidate den sites should be resurveyed, under appropriate denning conditions, if there is any potential threat of change to these habitat features in an area. dens in the BC snake den database. found). Conversely, this suspected underestimate is offset by likely declining trends that are suspected for most (>75%) of the known snake dens remaining in BC. Regardless of the limitations of these estimates they remain the most comprehensive surrogate estimate of the total provincial rattlesnake population available. In addition, a GIS analysis of den location in proximity to “nearest paved road” was conducted to provide some insight into habitat conditions. Road-related mortality is regarded as a severe stressor on the snake populations (Hubbard and Chalfoun. 2012). A review of road-related mortality, by Andrusiak and Sarell (COSEWIC 2004) found supporting literature that confirms depletion effects. A cited study suggested that snake populations were reduced by >50% within 450m of moderately used roads. Depletion effect was also still evident at distances ≥850m. A second cited study confirmed that the loss of only three adult female Black Ratsnakes (Elaphe obsoleta) in Ontario increased the probability of extinction to over 90% over 500 years. The life history of rattlesnakes, like other BC snake species, include traits that make a species’ population vulnerable (low fecundity, late maturity, long natural adult survivorship and seasonal migrations). As such, the cumulative effects of population depletion from road mortality may have serious effects on the genetic diversity of snake populations (Jackson and Fahrig 2011). Every attempt has been made to survey all habitats, with a bias against survey of areas near paved roads. This analysis shows the challenge faced in achieving this objective. Despite survey bias to avoid surveys near roads almost all suitable rattlesnake habitats in BC are bisected by roads. analysis is severely confounded by detection bias associated with sampling conditions. The data in the provincial snake den database is not robust enough to afford any insight to population trends provincially. An alternative analysis was attempted, to examine the population size (based on den count data) relative to (paved) road proximity to allow relative comparison of population sizes with differing road proximities however this afforded no additional insight. Unfortunately, the den count data in the database does not provide an accurate estimate of actual population size and as such population size patterns are ‘masked’ by variability in the available den counts. In summary, it is only pertinent to provide a summary of paved road proximity for 355 confirmed dens. This summary is provided here (refer to Table 3). range, for Region 8 & 3. In October 1996, the governments of all Canadian provinces and territories, and the Federal Government, signed the national Accord for the Protection of Species at Risk. All signatories committed to establishing complementary legislation to provide effective legal protection for threatened or endangered species, including individuals and their habitats, within Canada. On June 1, 2004 Canada enacted the Species at Risk Act (SARA). SARA prohibits the destruction of residences of listed species and defines residences as, “…a place or area in, or a natural feature of, the habitat of the species at risk that is habitually occupied or used as a dwelling place by one or more individuals of the species at risk, or considered as being necessary for that occupation or use” (BC Ministry of Environment 2007b). Rattlesnake hibernacula meet these criteria, and as such, the conservation and protection of rattlesnake hibernacula (i.e. residences) and critical habitat are federally mandated, within Canada, by the Species at Risk Act (SARA). In addition, in 2005, the BC provincial government signed a species at risk bi-lateral agreement with the federal government (the Canada-British Columbia Agreement on Species at Risk) (BC Ministry of Environment 2007b). This agreement clarified the roles and responsibilities of British Columbia and Canada as related to species at risk, with the purpose of coordinating federal-provincial efforts for species at risk conservation within BC. Eight years have passed and the development of effective legal protective mechanisms to ensure preservation of snake hibernacula is still required. An analysis of known rattlesnake den locations (n=318) in the BC den database, by tenure type, was conducted to assess conservation options available under the current regulatory framework in BC (see Table 5). Table 5: Summary of confirmed (C1) rattlesnake dens (n=318), by region, for each tenure type. aid in the conservation of these features on federal lands. specifically regulated to maintain habitat values for rattlesnakes. objectives to these other potentially adverse activities. Responsible and appropriate conservation and management of this species, and of the landscape features that are critical to the species’ long-term survival in Canada, is consistent with federal expectations of the BC Provincial Government, and is consistent with stated Provincial Government commitments under the 1996 national Accord for the Protection of Species at Risk (BC Ministry of Environment 2007b). This report provides a complete synthesis of over a decade of research and inventory on the Northern Pacific Rattlesnake throughout the species’ Canadian range. This synthesis also includes an analysis of covariates on a collaborative snake den database that was initiated by Mike Sarell and subsequently (and collaboratively) expanded, refined and maintained by both M. Sarell and J.Hobbs. In addition relevant learning’s from Hobbs’ MSc thesis work are included as this research on the species’ thermal ecology adds clarity and provides important information regarding our understanding of appropriate survey timing windows for this species in BC. mortality on rattlesnakes, within BC, I analyzed our BC database to assess “proximity to road” data for all 318 confirmed (C1) rattlesnake dens. within most areas of the species range in BC; this opinion is widely held by many herpetologists in the BC scientific community and supported by the fact that rattlesnakes have been eliminated from several large areas of their historic range in BC (e.g. along the south side of the Thompson River Valley, from Chase to Savona). rattlesnakes tend to aggregate (often with other snake species) for the denning period; this ecological trait makes this species extremely vulnerable to mortality sources, at or near dens, as these have a particularly pronounced effect on the entire range of the population of individuals using the den. Considering that adult male rattlesnakes have been documented foraging (during the active season) as far as 8km from their den site in BC (L. Gomez (2006) & J. Gosling (2010). pers comm) point source mortality has a far reaching potential influence. For example, if a snake population is influenced by point-source mortality (i.e. roadkill, persecution) at a den site the resultant effect is a reduction in population density that may be felt up to 8km away from the den. An analysis of the distribution of known rattlesnake dens (n=318) illustrated that 56% of known rattlesnake dens occur below 600m ASL; 92% occur below 800m ASL. In summary the majority of our known BC population of rattlesnakes aggregate, each winter, in valley bottoms where human activity (e.g. agriculture, recreation, urban development) and road density are at their highest. This statistic has obvious and profound conservation significance. There have been no previous attempts to provide an accurate quantitative estimate of BC’s resident extant snake population; as such, I attempted to address this using the provincial snake den database. To do this I assigned all known rattlesnake dens (n=318) to a size class based on the highest number of snakes observed at each den (see section on “Population Size”). In some cases these “den counts” were based on multiple visits however in many cases the value was collected during a single visit. Each size class encapsulated a range of values for the “number of snakes observed” (see section “Summary of Known Information”). A simple calculation of the number of dens within each size class yielded a range-value for the current BC population (based on den counts) of rattlesnakes at known dens. The estimated known population (based on den counts) ranged from a minimum of ~3,900 individuals to a maximum of ~8,000 individuals. These numbers may be used as a minimum estimate only as they are based on observed rattlesnake den counts. As such, caution is required when applying this conservative and approximate absolute abundance estimate of the BC population size. The actual population size is likely larger as den counts will underestimate (by a suggested factor of up to five times) the number of snakes actually using the den. In addition, there are likely many dens that exist but are not documented (i.e. not yet found). Conversely, this suspected underestimate is offset by likely declining trends that are suspected for most (>75%) of the known snake dens remaining in BC. Regardless of the limitations of these estimates they remain the most comprehensive surrogate estimate of the total provincial rattlesnake population available for BC. such, standardization of sampling conditions is virtually impossible. ‘counts’ relative to the actual number of snakes that were present. den. I suspect that there is likely a very strong correlation between distance to road relative to actual population size, actual rate of population change and actual population density within a given meta-population. In the absence of more accurate quantitative information on population size, density and rate of change, perhaps the most obvious indication of the threats, and the concomitant perceived resulting decline in BC’s resident snake population, is an anecdotal (experience based) assessment of meta-population health. Our accuracy and understanding of the species’ current provincial range has improved dramatically in the last decade. This species has been the focal taxa of six masters’ research projects in BC (including M. McCartney, J. Brown, L. Gomez, J.Hobbs, J. Gosling and E. Lomas). In addition, there is now over two decades of inventory information, collected by several key researchers (M. Sarell, J.Hobbs, W. Alcock & F.Iredale), over the entire BC range of this species. This improved collective understanding provides consistent and alarming insights regarding the ‘health’ (or suspected rate of population change) of each meta-population in BC. Concerns regarding anthropogenic influences on the long-term persistence of this species have been iterated by each of these individuals. This report presents a geographically broad field-based perspective for this species in BC. Based on this information it is suspected that declining trends are ongoing within >75% of the snake populations within the species range in BC. There are currently only five areas that remain relatively un-impacted by roads (or other anthropogenic activity) in BC. 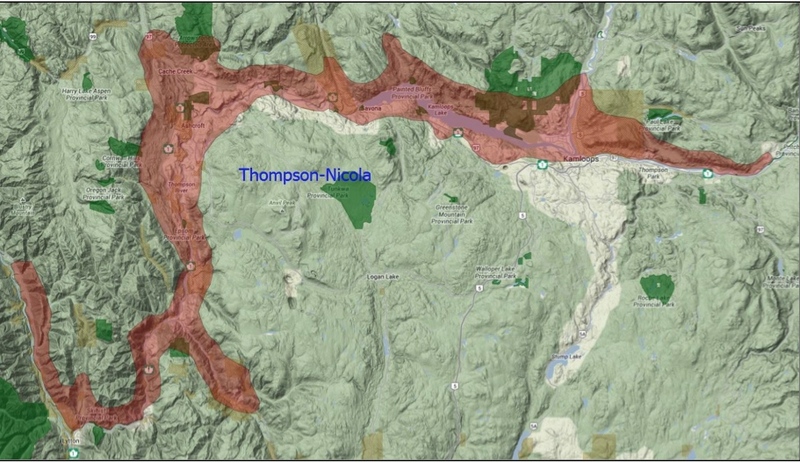 Four of these areas (described below) are in the Thompson-Nicola population; one is located in the Okanagan-Similkameen population and there are no un-impacted areas remaining in the Vernon, Midway or Grand Forks populations. Descriptions of each un-impacted area are provided below. limited denning aggregations tend to be larger (pers. obs)). during a single visit at the only den (Epic Den) found that day. continuing to Lytton are comprised of tall sheer limestone cliffs. but there are undoubtedly more dens waiting to be discovered in this area. 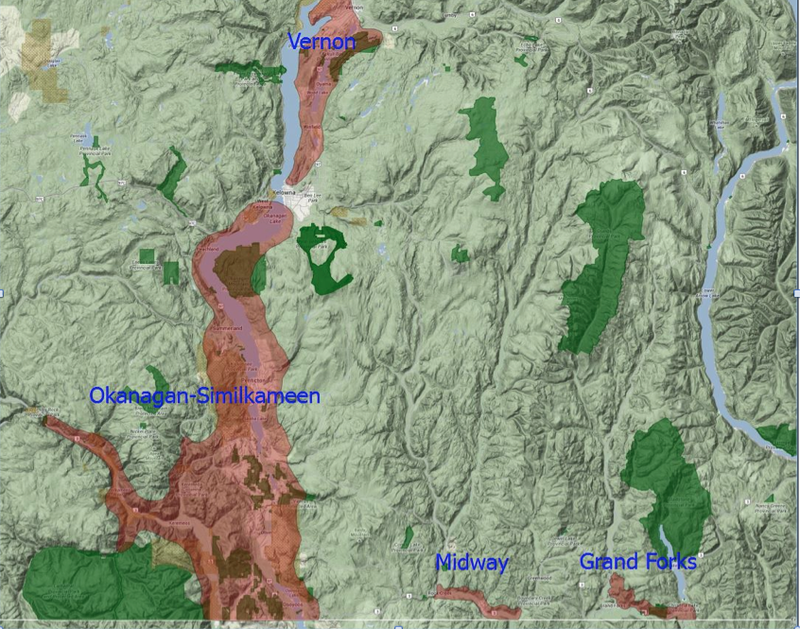 entire Okanagan-Similkameen population that is not impacted by roads. single very isolated (and likely declining) population at Mt. Boucherie). the health of the resident snake population in the area is unclear. Unfortunately all remaining areas of snake habitat, in the BG, PP and IDF BEC zones, within the range of all five currently disjunct BC populations are impacted, to varying extents, by anthropogenic influence. Throughout all remaining snake habitat in BC roads, urban development, intensive agriculture, railway right-of-ways and intensive recreational use continue to have a strong negative influence on the quality of snake habitat with a concomitant negative effect on adult survivorship of snakes (including racer, gopher snake, rubber boa, night snake and even garter snakes (T.sirtalis and T.elegans). The resultant influence on the current snake populations within many of these impacted areas (~75% of the species’ BC range) is typically quite severe. Despite difficulties associated with accurate quantification extensive field observation suggests that snake populations have (and will continue to), declined sharply within these areas. This supposition is strongly supported by the fact that the species has already been eliminated from several large areas of its former range. represent the best available range-wide information for this species in Canada. This collective understanding, gained from over a decade of inventory and research on this species by multiple individuals, indicates strongly that there is obvious cause for concern regarding the likelihood of the continued persistence of rattlesnakes in BC. Communal denning behaviour increases snake populations vulnerability. Point source mortality, especially when concentrated near snake hibernacula, results in population depletion that affects the local population at a broader landscape level for snakes with large territories (including racer, gopher snake and perhaps even garter snakes (T.sirtalis and T.elegans). Sources that exacerbate point source mortality for snakes (all species) include urban development, intensive agriculture, railway right-of-ways and intensive recreational use. These factors are estimated to negatively influence snakes in BC within approximately 75% of the species’ current BC range and the influence is generally thought to be quite severe despite difficulties associated with quantification. In addition, loss, through intentional or accidental destruction of snake hibernacula has occurred (and will likely continue to occur) in BC (pers obs). Den destruction also results in the elimination of many individuals and possibly entire populations of snakes from an area (Klauber 1972). Naturally occurring features that facilitate over-winter survival in BC are limited in availability on the landscape. The importance of over-wintering denning sites (hibernacula) to the ecology of snakes in temperate regions, coupled with the high fidelity of snakes to these sites (Klauber 1972), suggests that the conservation of both den sites and habitat surrounding den sites is likely required to ensure snakes continue to persist. For these reasons, conservation of snake hibernacula is viewed as critically important for the conservation of entire snake populations in BC. In BC, the only current conservation mechanism available for the management of snake populations is the Identified Wildlife Management Strategy (IWMS) under the Forest and Range Management Practices Act. In order to conserve habitat for identified species (as listed on the Category of Species at Risk) Wildlife Habitat Areas (WHAs) can be established at known den sites on provincial crown land. Measures are applied within established WHAs to ensure that the den site and the surrounding habitat are protected from potentially detrimental forestry or range practices. Although rattlesnakes, racers and gopher snakes have been designated as Identified Wildlife this enactment affords very limited effective protection to snake populations as the most intensive threats (road mortality and urban/agricultural development) are not addressed under this legislation. In addition, WHAs can only be designated on provincial crown lands. An analysis of all known rattlesnake dens demonstrates that only 42% of the known rattlesnake den sites (n=318) in BC occur on crown land and application of this conservation mechanism is thus restricted to less than half of the known dens in the province. Although IWMS is a positive start for addressing snake conservation in BC this mechanism alone is insufficient for conservation of rattlesnakes at the landscape scale. In 2004, the federal Species at Risk Act (SARA) was assented and in 2006 the provincial government publicly committed (in a federal-provincial bilateral agreement) to develop legislation that would afford SARA listed species equivalent protection to ensure parody with SARA. As of 2013, this commitment still has not been met by the province, despite the bilateral agreement, for application on provincial crown land. Where SARA does currently apply (i.e. on federal lands) protection is still inadequate as a formal residence description (e.g. snake dens and maternity sites) have still not been accepted and critical habitat has not been defined. More effective and comprehensive legal protection is obviously still required to ensure that rattlesnakes, gopher snakes and racers have a reasonable chance of persistence in BC. In the interim, continued survey for snake dens is recommended to build upon our collective understanding of species distribution and important habitats. The use of aerial assessment methods has proven to be an extremely cost effective method to refine and focus search efforts. The application of this method (as described in this report and in Hobbs. 2010) should be expanded to other areas. In addition, the use of infra-red aerial assessment methods should be explored, beginning with a pilot project in the Kamloops Region, to improve predictive aerial assessment methods even further. Finally, a long-term monitoring project should be initiated at several known den sites. Baseline data already exists for Kalamalka Provincial Park so all 21 dens in this area are logical candidates for a longer term demographic study (to assess vital rates including fecundity, survivorship and rate of population changes). If a successful (i.e. non-detrimental and effective) method for population monitoring can be developed this method should be selectively applied in other portions, and at other dens, within the range of the species in BC. BC Ministry of Water, Land and Air Protection. procedures.html (accessed April 15, 2010). Status of Endangered Wildlife in Canada. Ottawa. vi + 26 p.
Endangered Wildlife in Canada. Ottawa. vi + 69 p.
the Denning Ecology of Northern Pacific Rattlesnakes in British Columbia. detections. Herpetologoical Conservation and Biology 7(2). September 2012.
habits, life histories and influence on mankind. Reprint of second edition. University of California Press, Berkeley, CA. Macartney, J. M., K. W. Larsen, and P. T.
Meidinger, D., and J. Pojar (eds.). 1993. Sarell, M. 2013. Personal communication. and Canada. ECO Herpetological Publishing and Distriubtion. 2010.